Steven Brill, Class Warfare: Inside the Fight to Fix American Schools. New York. Simon and Schuster, 2011. $28. 441 pages. I have spent many days reading Brill’s book, and my free copy (sent to his followers by education reformer Whitney Tilson) is heavily dog-eared, annotated with objections, and exclamation points. Since it purports to be an inside account of attempts “to fix America’s schools” that will appeal to those interested in the interactions between bureaucrats, government or union officials, and other technocrats operating within the Democratic Party, this review will focus on the major message of Brill’s efforts. I should also preface the review by saying that Brill’s attempt at moderation, along with his careful distancing from [union-busting] conservatives, may be a ploy, for he is appealing to union-loving liberals, including teachers, to reform themselves to the point that accountability and a meritocracy may be furthered by his revelations of shocking behavior all around, shocking at least to those not familiar with the education wars in their latest manifestation: the teachers’ unions offensive against the charter school movement. The headline for my readers is this: there is a hard-fought battle within the Democratic Party (along with Republican moderates such as Rupert Murdoch and Jeb Bush) going on, regarding the failure of American public education. Powerful Democrats, egged on ostensibly by our education president, Barack Obama, and his Secretary of Education, Arne Duncan, are outraged that students in developed countries are way ahead of American students when tested for proficiency in science and math. Several liberal foundations, most famously the Bill and Melinda Gates and Eli Broad Foundations, along with hedge fund managers such as Whitney Tilson, have been attempting to impose a business model upon the profession of education. That is, they would like the 3.2 million schoolteachers, K-12, to be measured for their performance, and held to high standards. Brill, in conversation with Diane Ravitch, described their objectives as accountability and meritocracy, as opposed to the current heavily unionized profession that protects teachers’ jobs, not student learning. There is a heated interchange on C-SPAN Books, August 1, 2011 (linked here: http://hnn.us/articles/8-31-11/school-reform-grudge-match-diane-ravitch-vs-steven-brill.html), in which the redoubtable Ravitch, in her own words an ex-conservative (! )* attempts to diminish Brill’s heroes, such as charter school founders, e.g. 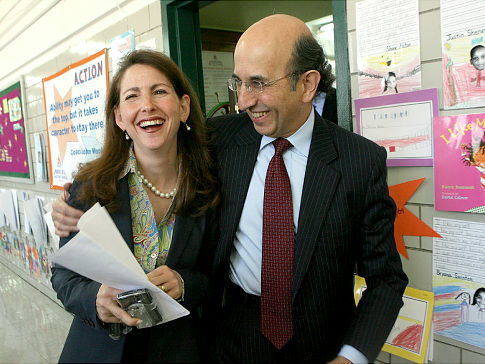 Eva Moskowitz, whose remarkable Harlem Success charter network has demonstrated that minority children can, through a well-thought out set of strategies (for instance, learning to discern the main message of a text), ace tests that their public school competitors fail; indeed her remarkable accomplishments and tenacity fill out his book. But Brill, as his long book ends, worries that Moskowitz’s rigorous demands on teachers and students alike will cause her [and her victims] to burn out. That leads him to suggest that 1. teachers in K-12 schools get higher pay, but 2. that they also sign on to no more than five or ten year careers, for he can’t imagine either Moskowitz or her teachers making a lengthy career of teaching school, virtually defying the low expectations that prior educators have had for blacks and Latinos in such neighborhoods as Harlem and environs. There are theoretical and practical problems with Brill’s general approach. 1. He can’t make up his mind as to whether teachers are professionals or workers, to be lumped in with firemen, policemen, and other state sector employees. Yet on the C-SPAN dialogue with Ravitch, he wants teachers to be professionals, like other pros, measured for their performance. In my view, teachers should see themselves as middle management, dependent on social forces and institutions that attempt to dictate their methods and aims, sometimes ambiguously, so that they may be left to drift in a sea of uncertainty, hence unable either to help students learn or to please their supervisors. In a country like ours, filled with religious, sectional, and other long-standing conflicts, there is no curriculum that will please everybody. Like other social democratic band-aid measures, the entire enterprise of education reform fails to examine the big picture that puts teachers in double binds: are they to prepare their students for a life of independent, critical citizenship, or for conformity to unknowable or shifting “standards” for the sake of “social cohesion”? Should there even be a federal Department of Education, or should all education be locally managed, with major funding derived from property taxes? If teachers are a profession, should they not be relatively autonomous in their classrooms, or are they to be cogs in a vast machine constructed by non-professionals? And 2. Brill actually has a fantasy that Randi Weingarten, hitherto a reform-resistant teachers union leader and stalwart, should be appointed chancellor of the NYC school system, for, as an astute operator, she is most likely to be able to raise up the mediocre (or sub-mediocre?) majority of current teachers to heights that would please the Big Money education reformers, saving American progress in science and technology. Meanwhile, although Brill has demonstrated ad nauseum the intransigence of the union establishment, he trashes Republicans such as Wisconsin Governor Scott Walker or “so-called right to work states” that defy Big Labor. Given the hostile “interview” conducted by Ravitch for C-SPAN, it is hard to follow Brill’s logic of one big happy family, redeemed by such as himself, a non-teacher who has latched onto a scandal that can have no solution, given the premises of Big Government, its beneficiaries, and its electoral base. By the end of their 59 minute sparring match on C-SPAN, Brill and Ravitch had come to an amicable ending, as Ravitch called for “collaboration” as opposed to competition [between charters and traditional public schools]. Such are the ways of “moderates.” There is no easy fix to the education problem. Both Brill and Ravitch adhere to a management-labor model of class warfare. Is it not time to leave this model behind as a relic of an earlier period of industrialization? Might not teachers look to new forms of solidarity? But that would mean a massive change of consciousness, and the relinquishing of such elite-driven intiatives as multiculturalism. The curriculum is everything. If Eva Moskowitz’s students can learn to decipher textual messages, study science in the earliest grades, along with chess (! ), what might our youngsters accomplish with the encouragement of a student-focused teaching culture? *Ravitch may have been, in her own mind, a conservative Democrat, but she always floated above the fray, crafting a career that was just critical enough to qualify herself as an objective, analytical scholar. See my blog on her “higher moderation” here: https://clarespark.com/2011/05/28/who-is-a-racist-now-2/. Do you favor the business model? Which model prevails in those countries leaving our systems in the dust? I see no reason not to tie teacher performance to the individual learner’s achievement. As for other countries, do the research and get back to us. I have added to the blog and asked bigger questions than I did in the first draft. If there is always a direct correlation between instruction and achievement perhaps this would make sense. But the “monkey rope” isn’t tied between the teacher and student…but the teacher, might be seen as Queequeg on the whale and there is no Ishmael to care how he fares but instead the rope is tied to the student’s friends and enemies, parents and now “social” instruments of attention deficit.